Mayor Bill de Blasio said his plan to build or preserve 200,000 units of affordable housing resulted in 21,963 units being built or preserved in 2016, the most in a single year since 1989. NEW YORK CITY — Mayor Bill de Blasio's plan to build or preserve 200,000 units of affordable housing resulted in 21,963 new units in 2016, the most in a single year since 1989, he said. That brings the three-year total of the mayor's administration to 62,506 apartments that have been built or preserved, providing housing for approximately 162,000 New Yorkers. "We know that housing is the number one expense in peoples' lives," de Blasio said at a press conference in Williamsburg. "If people can afford housing they can afford to live here. If they can't afford housing, ballgame's over." The 2016 units put the city on budget and ahead of schedule in the quest to produce the 200,000 units over 10 years that de Blasio promised when he took office in 2014, the mayor said. The city financed 6,844 new units last year and preserved 15,119. Since 2014, the city has financed 20,854 new units, or 33 percent of the total, and preserved 41,652 units, 67 percent of the total. Sitting behind a banner that read, "Still Your City. Keeping New York Affordable," de Blasio said the bulk of the created and preserved units would help middle class New Yorkers. Of the units financed last year, 48 percent, or 10,650 of the 21,963 apartments, were for families who earned 80 percent of area median income, or between $40,801 to $65,250 for a family of three. De Blasio cited the $19 million project at Monsignor Alexius Jarka Hall on Bedford Avenue that will keep 63 apartments for senior citizens affordable for 35 years. The building's electrical, plumbing, roof, exterior and the kitchens were refurbished as part of the agreement with the city. No unit there costs more than $1,000 per month, despite the average monthly price for a one bedroom in Williamsburg being $3,000, officials said. The city has financed 4,043 units for seniors since 2014. "All New Yorkers should be able to live, to move to the neighborhoods that they believe will be a better place for them, and they should also be able to stay put in a neighborhood they love when they believe that that is the best course for them," said Vicki Been, commissioner of the Department of Housing Preservation and Development. The city has financed the units by doubling HPD's capital budget to $789 million since 2014. The most recent 10-year capital plan includes $7.5 billion in funding for affordable housing. In the past, de Blasio has been criticized for not making sure enough of the units were for the very low, extremely low-income residents and the homeless. Last year, the city built and preserved 7,708 units are for the very low and extremely low-income, categorized as a family of three that makes less than $24,500 up to $40,800. That's 35 percent of the total of units built or preserved last year. Of the 62,506 units built or preserved since 2014, 17,246, or 28 percent were for low or very low-income families. "I think that shows a lot of commitment," de Blasio said in describing the difficulty in making sure that the city also helps housing for working class and middle class New Yorkers remain affordable. But Katie Goldstein, a spokesperson for the Real Affordability for All, a citywide coalition that advocates for housing for the low-income and homeless, said it wasn't enough. Since 2014, the city has financed 5,160 units for the homeless. The city is experiencing record homelessness with more than 60,248 people in shelters as of Wednesday. 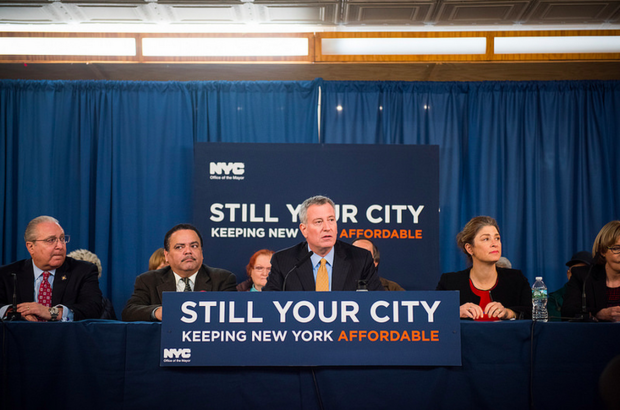 “At a time of record homelessness in the city, Mayor de Blasio’s self-congratulatory victory lap on affordable housing is offensive and wrong,” said Goldstein. "More than half of the apartments he touted are going to middle-income New Yorkers, not homeless or low-income New Yorkers who are most in need of deeply affordable housing." Moses Gates, director of community planning and design for the Regional Plan Association, said the city is noticeably placing more focus on low and very low-income New Yorkers in its housing efforts and should be congratulated for doing so. "An effective affordable housing program is about meeting the needs of the city and the needs of the city are on the very low-income end," said Gates. "There's been a shift towards recognizing the importance of that type of affordable housing and I want to commend the administration that its become a metric."